Acer has introduced one of the industry’s first convertible notebooks designed for casual gamers. The Nitro 5 Spin machine is a rather unusual form-factor. It has a 15.6” IPS display, is equipped with Intel’s 8th generation Core i-series processor, NVIDIA’s GeForce GTX 1050 mobile GPU and uses an aluminum chassis with red elements to emphasize gaming nature of the device. The unusual bit is that this is a convertible gaming laptop. Acer plans to ship the Nitro 5 Spin laptop in October and its starting price is not going to be too high — less than $1000 in the U.S. In the recent years, the majority of high-end notebook makers focused primarily on several kinds of halo products: ultra-high-end gaming notebooks with advanced GPUs as well as ultra-thin 2-in-1s and clamshell machines. Over the past 18 months, leading PC makers released powerful yet sleek gaming notebooks (featuring NVIDIA’s MaxQ) and ultra-thin consumer or professional laptops (based on Intel’s Core Y- and U-series SoCs) showing a clear progress both in terms of performance and in terms of portability. However, when it comes to mainstream 15.6”-class machines, only a few PC makers really tried to push them forward significantly. There are exceptions like Dell’s 2017 XPS 15, but in general, affordable 15-inchers were not progressing as fast as their smaller, heavier or just more expensive brethren were. 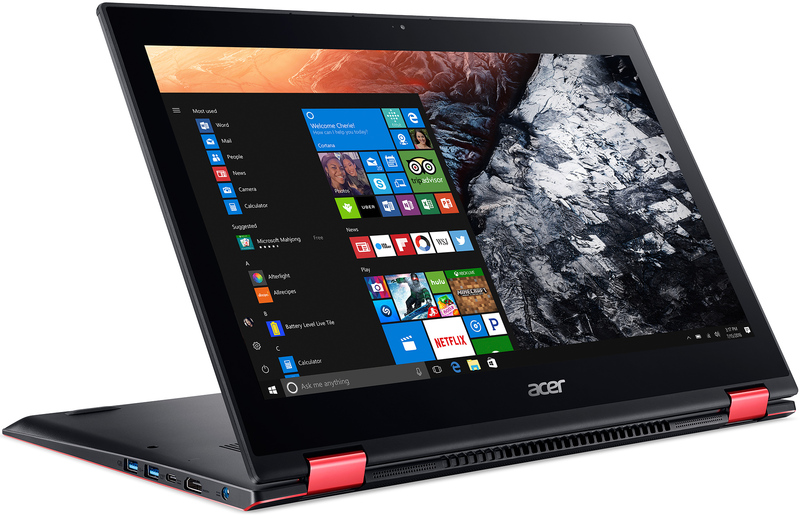 With the launch of the Nitro 5 Spin, Acer is advancing its 15.6” machines for consumers quite significantly. 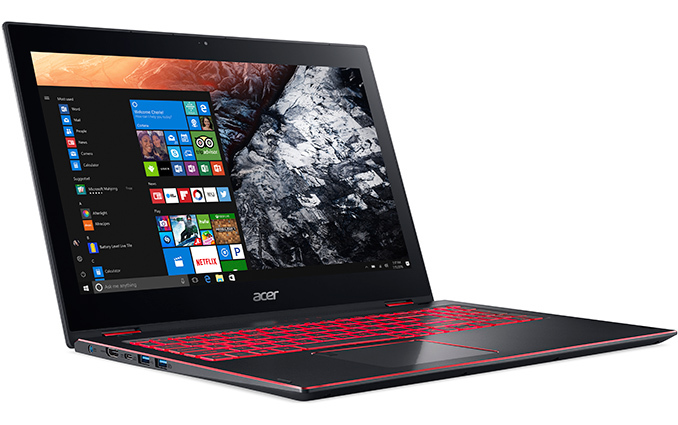 The new Acer Nitro 5 Spin will be powered by Intel’s 8th generation Core i-series processors with up to four cores. Higher-end Nitro 5 Spin SKUs will be equipped with NVIDIA’s GeForce GTX 1050 discrete GPU with GDDR5 memory, which offers enough graphics processing horsepower to run casual games at FHD resolution, according to Acer. For storage, the system will use an SSD with up to 512 GB capacity as well as PCIe interface, but the manufacturer does not elaborate on specifications. 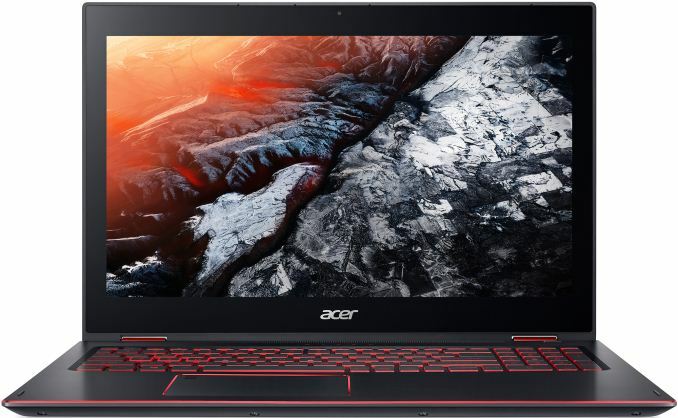 Acer is aiming its Nitro 5 Spin precisely at young customers interested in gaming not only by including a standalone GPU, but also by many other elements. The Nitro 5 Spin is made of black anodized aluminum, it has a distinctive thin design with multiple red inlays, red 180-degree hinges and red keyboard backlight (with highlighted W, A, S, D letters). The laptop is equipped with a 2.1-channel audio sub system featuring two speakers and a subwoofer (as well as the Dolby Audio Premium badge), a typical feature of gaming mobile PCs. Finally, the Nitro 5 Spin comes with an 802.11ac Wi-Fi controller featuring MU-MIMO capability to speed up Internet connection over compatible networks. 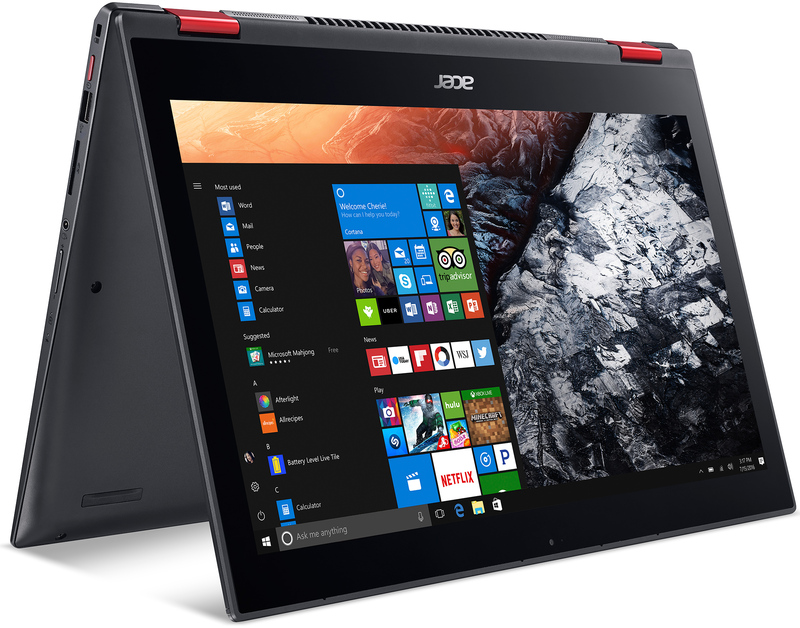 When it comes to wired connectivity, the Acer Nitro 5 Spin has two USB 3.0 Type-A connectors, one USB Type-C header with display support, a USB 2.0 port, one HDMI output, a TRRS audio connector and an SD card reader. Finally, the system has a fingerprint reader for added security. It remains to be seen whether gamers actually embrace a laptop in a convertible form-factor that can work in traditional, tent and tablet modes. This is not a feature they primarily need and therefore they may prefer something more traditional, but which is either more powerful or more affordable. But, even people who purchase gaming laptops don't just game on them, so this is a fairly interesting design for an affordable price. Speaking of pricing, Acer’s Nitro 5 Spin will be available this October for $999 in the U.S. and for €1199 in Europe. Keep in mind that configurations vary by region, so systems to be shipped in one country will differ from those in other countries. Big whoop. The 720 still has a quad core option. The difference in performance will be negligible. I have an Lenovo Y50 and I would not purchase another Lenovo ever again - Acer is not that good - they probably did this to say me first Ultraweight 4 core laptop - I see Dell coming out with XPS 13 in this chip that would be really nice.